The right medicine is what we have found. We have substituted his nasty, make me mean, Keppra, with Trileptal, another anti seizure drug. This morning he is much more agreeable ! even though at this very moment we are still at the hospital. We moved him on to 50ml Fentanyl patch for 24hr medication and he gets Toradol every 6 hours on top. In short, he is feeling much improved this morning !!! He got out of bed at 7 and started packing. The first time he has walked since we checked in. Yesterday, you couldn't even touch his legs. He has ordered breakfast and is patiently waiting. It is sooo good to see him feeling better. Did we just buy ourselves another day ??? Ryan is "fit to be tied"
Nothing is going his way today. First the Neurological team has slapped him back on Keppra and B1 for seizure prevention. He adamantly denies ever having one and is positive there isn't one in his future. He has let everyone here know, he is here for "PAIN, NOT SEIZURES !!" We made it through his Nuclear Bone Scan. He did sooo well staying perfectly still even though we can't eliminate all the pain. I have been doing my best to convince him he WILL be doing the MRI at 5. This has been difficult to say the least. 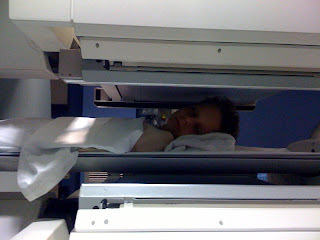 Now Dr. George comes in, one hour before the MRI and tells us we are not going home ! He has assured us that we will be first on the checkout list in the morning. Can you imagine the state of his PO'd-ness after that! (that damn Keppra doesn't help either). Thank you Erin for providing our friends and families a "real time" update first thing this morning. Things were moving so fast down here at Scottish Rite. The crazy thing is, I would have normally waited to take Ryan to the clinic until after 8am. This saves Ryan all the hassles that the emergency team put him through. Today though, something just made me say, "we'd better go now" 3am. What luck to be in Emergency when his seizure happened. Nothing seemed to be out of the standard routine. We were in a dark room and it appeared Ryan began to stretch and turn to look at me. His eyes were open so wide and I made a quick quip. After a couple seconds of processing and I realized the hollow look in his stare. I hit the call button and opened the door yelling code blue. A four person staff was in the room, working in under 10 seconds. It is scary to be there and almost as scary reliving it right now. 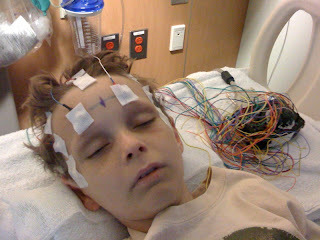 The seizure and morphine combined to put him out for a few hours of much needed rest. Missy made her way down to the hospital before 9am. All the tests seem to show stable signs. He will start back on the anti seizure medicine, Keppra. He is in incredible pain in all his major muscle groups, a pain that morphine hardly eases. He has it every 4 hours. Kristen Connor popped in to see if there was anything she could do , and Smith and Julie stopped by to help cheer him up. They ended up driving Missy and her car home tonight, as Missy is hardly doing much better than Ryan. We are hoping to be out tomorrow and back at home, safe and sound. Thank you all for your kind words, thoughts and prayers. Sincerely, Les, Missy, Hedi, Will and SuperRyan. 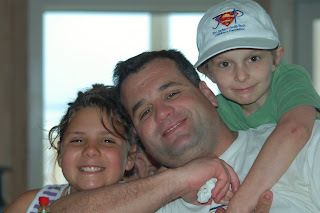 Missy called me this morning and asked me to update the blog. Ryan spent yesterday on the couch with severe leg and arm pain and could not keep anything down. He started to run a fever in the middle of the night, and Les took him to Scottish Rite at 3 AM. Missy told me that she talked to them earlier and they were both in tears. Ryan had a seizure at some point after arriving at Scottish Rite. His pain is so high that they have basically knocked him out with strong morphine. They will be staying in-patient at Scottish Rite until the pain can be controlled and a plan formulated. Missy is driving there right now. She asked me to post this information and to ask for your prayers. They are obviously very worried. Missy has had a lot of pain in the left kidney area the last couple days. She called her Dr at Emory and they suggested a quick trip to Emergency, haha. Our only bummer is that we didn't win a gigantic "Balto" at one of those rip-off midway games! It's a shame the kids don't really know too much about Jaws, or Beetlejuice, or ET. I think their favorite rides were the Simpsons and the Mummy. This is Balto!! We've known him since the day he was born and have been able to play with him and watch him grow. He's really only about 5 weeks old, but his mom is pretty much done with him and his siblings. He was a gift from Rick and Barre'. We're missing him already. His mom is a Siberian Husky (maybe 35 lbs) and his dad was a neighbor German Sherpherd. All I know is Sandy's daddy was a German Shepherd and we got her Easter weekend, too, and she turned out to be the best dog ever! So I'm taking that as a good sign. It's been a crazy past couple of days. The SURPRISE is that Ryan is at the beach with the Lighthouse. As we headed down Thursday morning, we got a call from Smith that he was gonna go down for 3 days, so we offered our baby up for some fun!! My mom met us at Gwinnett with him. He still wasn't feeling that great, but he was pretty excited. He's coming home tomorrow. The SHOCK is that Les' high school friend who has been in Tanzania doing some missionary work has suffered a major stroke. How can that be?? We are still working on the details as you can imagine. I know they are trying to raise money to get him back to Canada, and I hope to post some of that info we maybe we can help. The absolute DISMAY is in the passing of Erin Buenger. I haven't thought of much else in the past couple of days. Please visit her website and offer some encouraging words to her family. She was such a full-of-life kind of girl that just had a way of touching your heart.